Filming for the hotly-anticipated third season of the hit Netflix show “The Crown” has started in the UK! Fans who can't wait until the new episodes air in 2019 can fill the void by taking one (or both) of the two NEW private chauffeur tours from Evan Evans during their next visit to the UK. These tours bring together the show's spectacular filming locations in London, or across England. Evan Evans' two new "The Crown"-inspired itineraries offer the perfect day out for followers of the multi-award-winning series. These luxurious private tours allow guests to travel in style, accompanied by both a dedicated driver and a professional guide, who will create a sightseeing experience that is fit for a king or a queen. Evan Evans specializes in unforgettable, hand-crafted trips to Britain's most iconic locations, so is perfectly suited to bring the UK's royal history and heritage to life. "The Crown" Film Locations: London* is a half-day (five-hour) tour that whisks guests to the exciting London-based locations featured in the hit series. Visit Southwark Cathedral and The Old Royal Naval College, the backdrop to the scene where King George VI's funeral was held prior to Elizabeth II being crowned Queen, and the location for the courtyard at Buckingham Palace, respectively. Explore Lancaster House, which provided stood in for Buckingham Palace in many scenes, and see The Lyceum Theatre's dramatic façade, which was used for the gala scene where the Queen and Prince Phillip are adorned in tiara and tux. The tour is priced at $1,156 for 1-3 guests in a Mercedes E-Class, or $1,272 for 4-6 guests in a Mercedes V-Class. A professional driver, tour guide and central London pick-up and drop-off are included. "The Crown" Film Locations: England** is a full-day (nine-hour) tour that takes guests to visit the iconic locations outside of London where "The Crown" takes place. Explore the settings of many well-known scenes, including Cambridgeshire's Ely Cathedral, where the wedding of Elizabeth and Prince Phillip was recreated; and Hatfield House, which provided the bedroom of the dowager Queen Mary, the drawing room where Queen Mary met with her son the Duke of Windsor for the first time in nine years, the library at Windsor Castle, and the hall where Elizabeth announced that she would be taking the Windsor name. Prices start at $1,356 for a one-person private tour in a Mercedes E-Class. Entrances to and guided tours of Hatfield House, Knebworth House and Ely Cathedral are included, as well as a professional tour guide and central London pick-up and drop-off. For a totally unique experience, bespoke tours are also available via the dedicated Evan Evans concierge team, and a choice of motor vehicles, including the Jaguar XF and a vintage collection, are offered on request. For more information and reservations, visit www.evanevanstours.com or call Evan Evans at (866) 382-6868. This year, producers of this popular weekend long storytelling extravaganza, West Side Stories' Dave and Juliet Pokorny are offering two completely different headlining shows at The Mystic Theatre in Downtown Petaluma on Fri. & Sat. night (10/19 & 10/20). During the day on Sat. (10/20) 6 intimate-style events each feature one of this year's headliners at the Hotel Petaluma. The festival concludes on Sunday (10/21) with the Storytelling Assoc. of CA community conference. So, go ahead, pick and choose and build your own festival . . . enjoy! Petaluma River Summer Love — What is Happening with Our Super-Silted Slough? Confession time — it's not very often I find myself on the Petaluma River with the perspective of viewing the riverbank and city's waterside from the actual waterway. This July it was a treat to board a small, private yacht for a friend's birthday brunch and cruise (according to a perfectly timed tide) south under the D St Bridge, the freeway and the Smart Train bridge and back. How most of us do take this waterway for granted. The current debacle of a chronic 14 year build up of silt choking the tidal slough is all the more obvious in the dry summer months and so it was a small miracle to me that we were able to move along at all. According to the U.S Army Corps of Engineers Operations and Maintenance (O&M) is responsible for providing dredging of a channel 200 feet wide to a depth of -8 feet Mean Lower Low Water (MLLW) across the flats in San Pablo Bay to the mouth of the 14 mile Petaluma River, located on San Pablo Bay in Sonoma and Marin Counties (Across-the-Flats Channel), 100 feet wide and -8 feet MLLW thereafter to Western Avenue in Petaluma (River Channel), and a turning basin 300 to 400 feet wide to -8 feet MLLW. The Corps of Engineers has been undergoing a roughly $600,000 study to figure out how much build-up there is in the channel that was last dredged in 2003. The cost factor of the dredging project is a major issue due to limited funding availability of millions of federal dollars required as well as the number of more high profile, high traffic competing projects. Come low tide, parts of the river are impassable. Recreational boaters and commercial shippers alike continue to be impacted, at least until summer 2019, when, it is hoped, but not yet secured that funding will be forthcoming for dredging to start. The Petaluma Marina has been badly hit by a 40% dip in moorage, according to reports. The Chamber of Commerce sites a tremendous loss to downtown businesses since recreational boats have had a hard time mooring at the deserted downtown dock. Non-profit Petaluma Yacht Club at the Turning Basin is a local gem that was forced to cancel a vital fundraiser due to impassable waters on Memorial Weekend. The City of Petaluma is hoping to utilize dredge spoils to restore habitat along the river bank and the wetlands at Shollenberger Park. Petaluma Argus Courier reported that in the future, to avoid this happening again every decade or so, the City of Petaluma is working toward a new partnership with the Sonoma Water Agency, Marin County, the City of San Rafael and the Napa Flood Control District to dredge a series of overlooked channels across the North Bay with the Corps of Engineers. Cutting costs with combining projects makes sense and I hope this plan is established for the future of the historic Petaluma River and neighboring waterways. What can we do as individuals to take more of an active interest in and support our Slough? In 2005 Friends of the Petaluma River formed to connect our community with the wonders of the Petaluma Watershed. While much of this active non-profit's work focuses on conservation and education surrounding this sensitive habitat, it also believes that celebration plays a large role in its mission. Through events at the River Heritage Center, family programming around the Watershed and access opportunities for the public, Friends of the Petaluma River brings our Watershed to life. Experience the Petaluma Watershed for yourself on one of the Friends of the Petaluma River tours, kayak trips or through programming at the David Yearsley River Heritage Center. Sunset Wine & Cheese tours are a great way to relax as you meander down the River on a 17-foot cruising barge with knowledgeable River docents. Or if you’re feeling a little more adventurous, come explore the Watershed on your own steam by checking out one of a fleet of canoes, kayaks and row boats during the free Boating at the Barn program every Sunday from 10am to 1pm. Friends offers unique hands-on programming at the River Heritage Center to engage the community on the River. Summer break Green Heron Nature Camp for 6-12 year olds builds nature awareness through outdoor exploration and meaningful play. Individual and family programming at the DYRHC includes workshops on boat-building, marsh medicinals, wilderness survival and nature awareness. Sunday’s Boating at the Barn program is shepherded by volunteers. Find the crew at the David Yearsley River Heritage Center every Sunday from 10am to 1pm checking out boats to the community. A growing fleet includes rowboats, canoes, kayaks and a sailboat, all of which can be checked out for free after a short safety demonstration. *Please check the tides before going to the barn. Due to the lack of dredging in the River, when the tide is beneath 2ft, you cannot go out. Upcoming closure is August 12th. This year's Moonlit Fandango Event fundraises for the Friends of the Petaluma River and takes place at the beautiful and exclusive Rockin' H Ranch on August 18th, 2018. I've heard nothing but wonderful things about the North Bay Rowing Club, both the Junior Crew (boys and girls 12 to 18) and adult crew programs that make the very most of the Petaluma River year-round. The Rowing Club's Masters Program refers to the age category of 21+, and includes people of all skill levels. Thanks to the mild climate and protected waterway of the Petaluma River, North Bay rows year round both recreationally and competitively. NBRC’s Masters program offers coached and independent sweep and sculling and is available to anyone regardless of experience level, fitness level, mobility concerns, or competitive spirit. Whatever you want to get out of the sport, the Rowing Club can provide it for you! With a general membership, both incoming experienced rowers and first time learners have the opportunity to take boats out on their own time. NBRC members have access to all club equipment and facilities at all times of the day, so you can find the time in your schedule that works best for you. Once you've been cleared by a coach and have demonstrated your understanding of rowing and the required safety checks, club equipment becomes your equipment. Many NBRC members self-organize group practices and these can be found on club calendars. Middle School Learn to Row Team teaches the fundamentals of the rowing stroke, practice both sweep rowing and sculling and get experience working together in different kinds of boats. The focus is on technical proficiency and enjoying the time spent on the water, while also learning teamwork and developing the skills to compete at the high school level. No rowing experience is required to join the Learn-to-Row team. The High School Competitive Team trains extensively to compete at both the regional and national level against some of the fastest crews in the country. There's no experience necessary, and the basics of the sport will be taught to everyone during tryouts. My afternoon on the water renewed my appreciation of our heritage waterway that was the lifeblood to our community in its heyday during the Gold Rush. It all comes back to the Turning Basin when we talk about our history and the docks that carried passengers into the fledgling town and dairy and farm produce back down to San Francisco. We must not turn our backs on the crumbling waterfront in the heart of our downtown. Petaluma River Promenade is a vision for the future of this important place that has been so woefully neglected over the past couple decades. I'm looking forward to the first annual Petaluma Promenade Honky-Tonk Piano Competition fundraiser on September 15th where we'll be treated to the spectacle and sound of all the bright and colorful handpainted pianos we've been spotting around town these past few months. Brainchild of Petaluma Pete, this event will help raise money for a much needed pedestrian friendly boardwalk. Timo Rivetti has a whole lot to be thankful for since making his start in real estate as Rookie of the Year with Frank Howard Allen Petaluma, back in 1998. "My third son, Dom, was due that summer and after a career in the music industry UK and various start-ups and marketing positions here in California," says Timo "a friend in the industry fortuitously talked me into trying my hand selling real estate." The rest is history, with Timo taking to the streets to kick start his new career, walking the family's first dog, Kite, a Welsh corgi and talking to neighbors and property owners around town to sign his first listings. "It was a natural fit," says Timo, who moved on to join RE/MAX Real Estate in 2001 and Broker Associate at Keller Williams Petaluma in 2009. This year, 2018, after 20 years in the biz, Timo is ranked #1 real estate agent/broker for Keller Williams in Sonoma County & in the company's top 1% of agents nationwide. "I take my cues directly from my clients," says Timo. "By listening to their very specific, individual real estate needs, I make it my singular goal to realize dream properties in as smooth and seamless a transaction as possible. With over two decades of proven real estate success in Petaluma and neighboring communities, my clients know me as their go-to Sonoma County real estate pro." And with two decades of experience, Timo looks back on the regional real estate market when he started selling homes in 1998. "The median home price in Sonoma County twenty years ago was $220,000. Today, the same home sells for around $690,000." Home values have risen over 7% in the past year and the general forecast is for prices to continue to rise, though possibly at a slightly slower pace in the coming year." "A shortage of homes in the region has been exacerbated by last October's wildfires," says Timo. "Though an initial flurry of outrageous price gauging and an influx of all cash purchasing has thankfully subsided as things have settled down." While home prices appear expensive to long time county residents, outsiders moving north are drawn by the cost value of a Sonoma County lifestyle. "For instance, the Marin median home price is now up above the $1.1 million mark," says Timo. "In comparison, Petaluma median of $710,000 represents a significant deal to incoming residents." Born in England to Italian parents, Timo has called Petaluma home for the past 26 years. As a grounded and gregarious family guy with 3 sons all raised in Petaluma he remains an active man-about-town and region. "I'm proud to say that over 96% of my proven business comes from past clients, referrals & sphere of influence over the past two decades," he says. "I'm in constant contact with my clients past and present, as well as local business owners, non-profit and civic leaders. Knowing what is happening within the community on a day-to-day basis, giving back and being a good neighbor is key to keeping on top of the latest real estate opportunities and trends as well as what makes this such a great place to live and raise a family." Timo's Executive Assistant Reneé Waters has been an invaluable asset to the team for the past decade. Meeting individual buyer and seller's specific needs and goals, building and maintaining long-term client satisfaction is Reneé's number one source of pride in her role in the Rivetti Real Estate Team. "Community involvement and giving back is a big part of who I am as a person," says Timo. "I've built a wealth of volunteer experience into my career and family life, including being a founding member of the Petaluma Gap Wine Growers Alliance as a hobby winemaker and in my ongoing varsity soccer coaching with PHS." "My positive and proactive attitude is first and foremost in all of my real estate endeavors," says Timo. "I am so grateful to have represented a whole host of terrific clients over the years." Thinking back on the real estate scene in 1998, Timo recalls the explosion of the internet in property searches. "Prior to online listings, my wife, Frances and I wrote and produced a popular, personalized print newsletter that we hand stamped and mailed each month to our client base." Back in 1998, homes in Sonoma County were frequently decked out in gingham, ruffles and rooster prints. "Stenciling, faux finishes and sponge painting were all the rage," says Timo. Shabby Chic was a good thing for young families such as the Rivetti's, making a home for the family to race around and relax in. Remember slip cushions, distressed furniture, drapes puddles in mounds of fabric on the floor? Today, homebuyers are looking for a more paired back look! "Apple released its iconic, revolutionary new iMac and the proliferation of cell phones made for multi-tasking in real estate on the road." Timo recalls a family trip to the UK just prior to the cell phone revolution. "I stood in a red telephone box outside of a country pub in Wales every evening with my pile of 10 pence coins and a pint," he says. "I closed multiple transatlantic several deals with zero use of technology!" The google search engine was founded, making a massive impact on real estate. "Before this, property marketing was limited to local newspapers and postings in the real estate office window," Timo says. "The whole business of real estate is so much more efficient as a result of the internet in terms of exploration, selection and price comparison." Electronic signatures sure have revolutionized the documentation process in real estate. "Now, clients are able to read and sign from anywhere in the world," Timo says. "The real estate buyer and seller is taking a bigger seat at the table within the industry as new advances continue. Competition for prime properties is only set to increase in desirable regions such as Sonoma County." 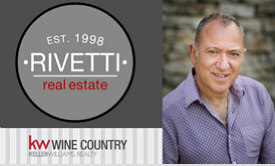 Back in 1998, when Timo was getting started, the Rivetti family purchased a first home in a charming Victorian home on Laurel Ave in historic West Petaluma. "We moved into the Victoria subdivision for more room to roam in the year 2000," Timo says, "there we planted vines, made wine and raised three awesome sons, Rocco, Luc and Dominic before making another big move to a mid-century home in the Sunnyslope area in 2016." "It's important to experience the market and a move on a personal level," says Timo. "A move is one of the most profound changes in my clients' lives. Being fully invested in where I live, work and play is key to providing a dynamic real estate service to clients with a wide range of property requirements from starter home to commercial building and sprawling private estate. I remain every bit as focused today when working with a first time buyer as with my long-time, highly trusting and in-turn, trusted referral base. Clients past and present continue to put my superior negotiation skills and acumen to work in all aspects of their real estate transactions, whether they are thinking of buying or selling in this fast-paced and increasingly competitive North Bay market." Real estate — it's one of the hottest topics people ponder and debate, aside from politics, these days. And we all know that boom and busts are central to the California housing market. "Of the more than one million Californians who lost their homes after the Great Recession of 2008, very few of my clients were forced into foreclosure," says Timo. "These past several years, the perfect trifecta of affluent and savvy investors, record low inventory and a market where stocks are up have led to the current real estate boom cycle." "Is this a good time to buy in Sonoma County?" — the number one question Timo is asked today. "The market could very well fluctuate in either direction," says Timo. "Yet home buyers have learned from the subprime buyers of 2008 and though housing inventory remains low, locking in current low mortgage interest rates makes sense for investing in real estate over the next couple of years." "Demand is there and buyers are competing against a hoard of competitive offers," says Timo. "That's where I come in as a seasoned professional negotiator in the Sonoma County market." The annual California Rare Fruit Growers of the Redwood Empire's annual tree sale takes place at the Original Santa Rosa Farmers' Market behind Sutter Hospital at 30 Mark West Springs Road, Santa Rosa, 95403 on Saturday July 14 2018 from 9AM until 1PM. Dozens of uncommon varieties of apples, pears, plums, pluots, figs, cactus-pear, berries and more will be available. All trees are custom grafted by the CRFG Garden Club to be sold as a fundraiser for donations to students’ agricultural scholarships and other ag-related non-profits. We have raised and donated over $20,000 to date. There are literally thousands of varieties of trees, vines and shrubs that bear edible fruit. Most people are familiar with only the most common varieties of fruits that are available commercially in stores. Many of these commercial varieties are available primarily because of the durability of the fruit for shipping, handling and storage rather than for best flavor. Even though the best tasting fruits can be too fragile for commercial distribution, they are perfectly suited to the home-gardener. Anyone with at least a six foot by six foot patch of open sunlight can successfully grow a tree with delicious fruits, even if only in a box of soil on pavement. Properly selected fruit-bearing plants can also be used for edible landscaping, proving a pleasing visual display in addition to gourmet treats. Multiple fruit varieties can be grown on the same plant by means of simple grafting techniques, resulting in a "fruit salad" tree! One member has over 100 kinds of apples on one tree! Rootstocks control the size of the tree, scions (grafts) control the kind of fruit produced. Types M111 and Geneva 41 rootstock limit tree to 6-10’ high, are highly disease resistant, and have been tested to tolerate wet heavy soil like the Santa Rosa plain. Geneva 202 is a semi dwarf, and Bud 9 is an extreme dwarf, which can be kept to 4’ high and 4’ wide with pruning, but will need drip irrigation and staking its whole life, though fruit will be normal large size. All trees are about 2-3' tall, grafted in March. Note that small trees will outgrow taller root-bound trees within a year or two. You can get more scions from us in January to add varieties to a "fruit salad tree", $5 entry, $5/graft by expert grafter, by keeping your tree in the pot and bringing it in for grafting then. We will have hundreds of more varieties available then in late Jan. See crfg-redwood.org in December for dates and times. Many of the best tasting fruits are only available from specialty catalogs and growers, or through hobbyist organizations like the California Rare Fruit Growers (CRFG) garden club. CRFG promotes interest in all aspects of fruit growing, with special emphasis on rare and unusual fruits. North Bay CRFG members in "Luther Burbank country" get together regularly to taste fruits, trade plants, and to swap tips on local growing techniques and what grows best in local conditions. One recent meeting featured over 100 different locally-grown fruits to taste! The results of prior "hard-core-expert" tastings are available on the club website, along with tips on growing, grafting, greenhouse construction, deer-proofing and other topics, at CRFG-Redwood.org.